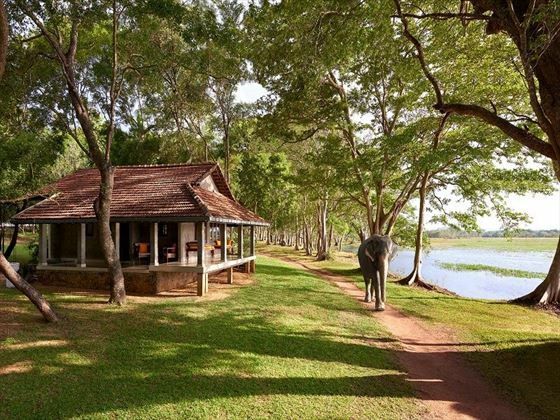 With beautiful cottages and lodges hidden amongst the trees, chattering monkeys and the sound of bird call ringing through the air, and long winding trails taking you to a tranquil lake and two delicious restaurants – Habarana Village by Cinnamon is clearly inspired by Sri Lanka’s traditional villages. 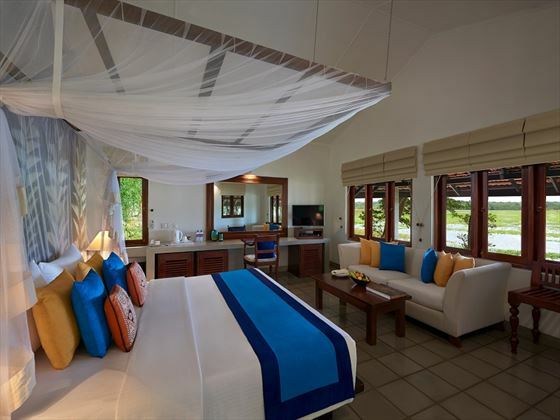 Located in Habarana, in the north central province of the island, this retreat adopts a simpler way of life, with emphasis put on enjoying an easy-going, slower pace. Unbelievably friendly, we’re certain you’ll feel right at home here. The rooms and lodges here a simple and minimalist, with many offering a small seating area and a veranda overlooking the lake. 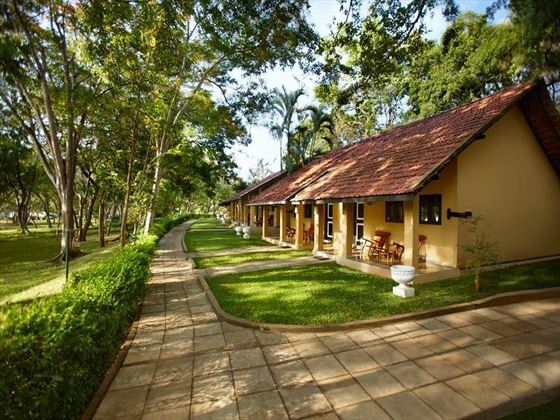 Our favourite is the Kingfisher Lodge, hidden away near a secluded corner of the lake. With such a focus on sustainable, easy living, the restaurants here adopt a farm-to-table approach with their locally sourced ingredients and spices. 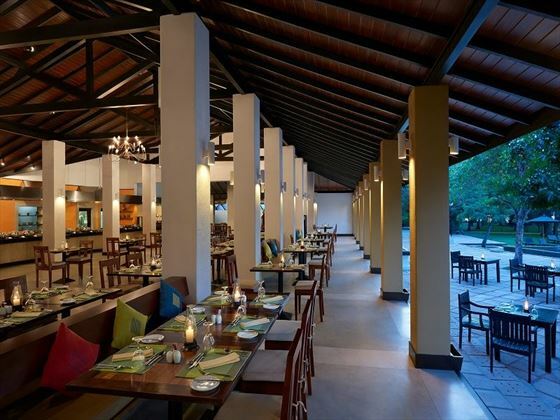 Families will enjoy tasty buffet meals at El Hena, whilst Panthaliya Coffee Shop serves coffee and snacks in the day, and sumptuous a la carte meals at night. Be sure to end your day at Matins – this laidback bar offers great wildlife spotting opportunities, and incredible sunset views. 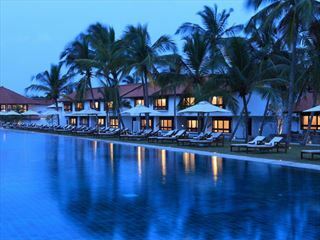 Further reading: Habarana Village by Cinnamon is featured in our guide to the top 10 family hotels in Sri Lanka. 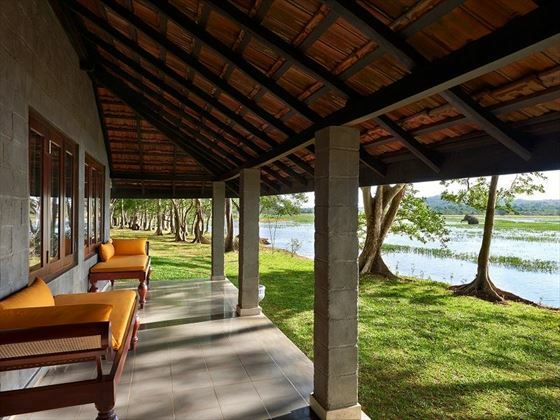 Tucked away among the trees of northern central Sri Lanka, this resort enjoys an envious position overlooking Habarana Lake. There’s a huge range of excursions and activities available in the area including birdwatching and trekking. 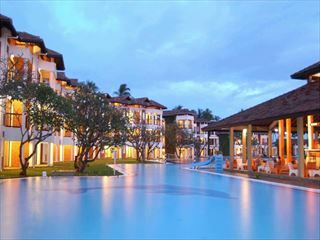 You can also arrange the opportunity to visit ancient cities and Sri Lanka’s famous UNESCO World Heritage Sites. There are also quiet towns nearby if you’re looking to experience some of the local culture. 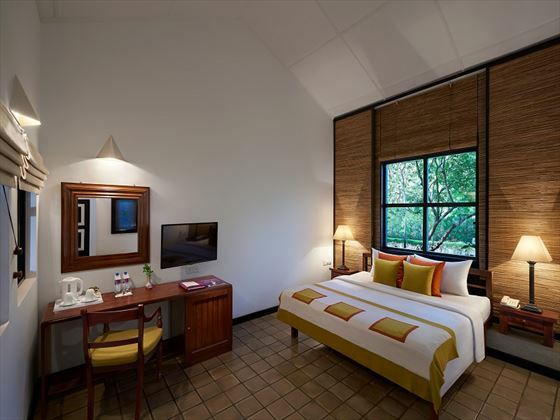 Superior Rooms – Charming rooms featuring the standard amenities, plus a veranda and teak furnishings. The 94 Superior Rooms are mostly arranged in hamlet clusters, ideal for large groups. 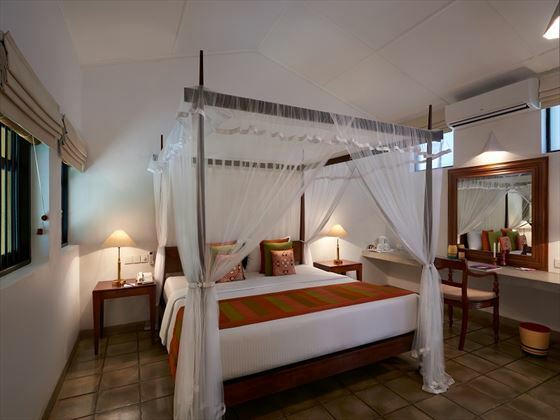 Deluxe Rooms – Spacious rooms, featuring minimalist décor, a king-sized four-poster bed, a small seating area and a flat screen TV. These rooms look out onto a lake, and each has an open-air bathroom. 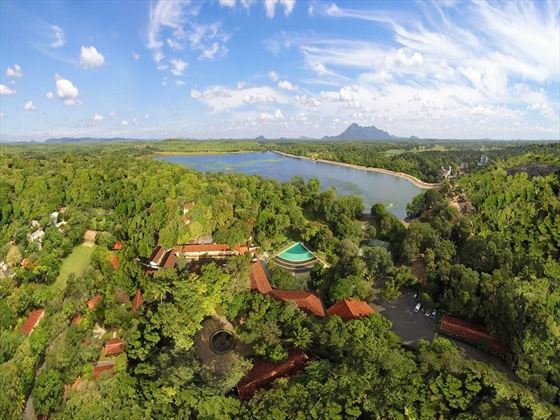 The Kingfisher Lodge – Located just steps from the water in a remote spot, this secluded lodge boasts modern furnishings, uninterrupted views of the lake, a TV, a larger living space, an open-air bathroom, and a furnished veranda. 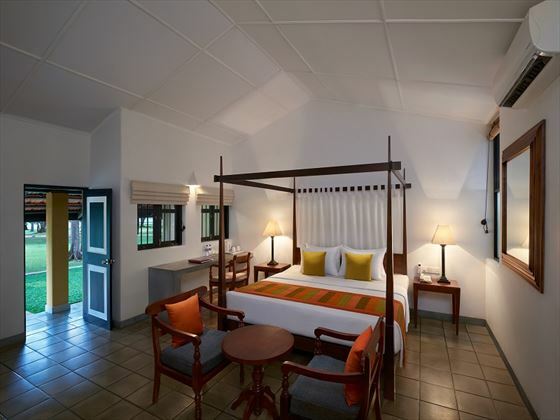 The Eagle Lodge – An expansive lodge nestled next to the deluxe rooms and therefore sharing its view of the lake. 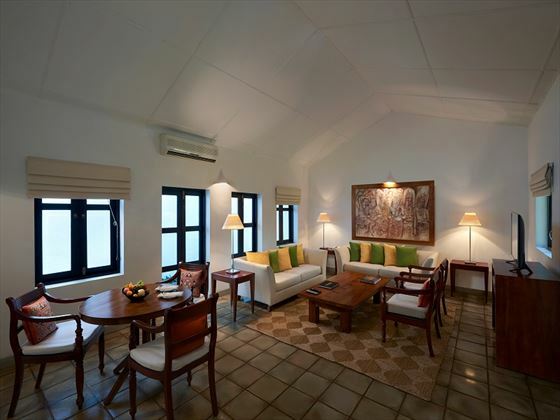 This regal lodge features a spacious living area, a dining table, an open-air bathroom, and an open-air jacuzzi. You can also have a private dining experience in this lodge, including an outdoor barbecue. El Hena – With a name referring to the local farming fields, it’ll come as no surprise that the food here is as fresh as it comes, using locally sourced ingredients and spices to create their own take on international cuisine. Offering a buffet for breakfast, lunch and dinner, the restaurant is semi-open-air, with views of the pool, gardens and lake. 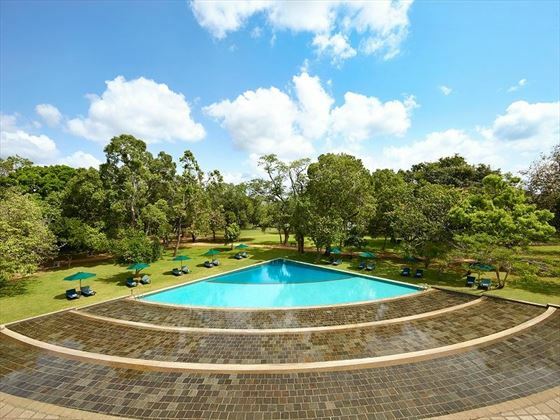 Matins – The hotel’s main bar is located by the pool, offering sensational sunset views and amazing garden vistas where monkeys and birds regularly pay a visit. Panthaliya Coffee Shop – Panthaliya means ‘village chalice’, and this restaurant offers a plethora of sumptuous a la carte options. 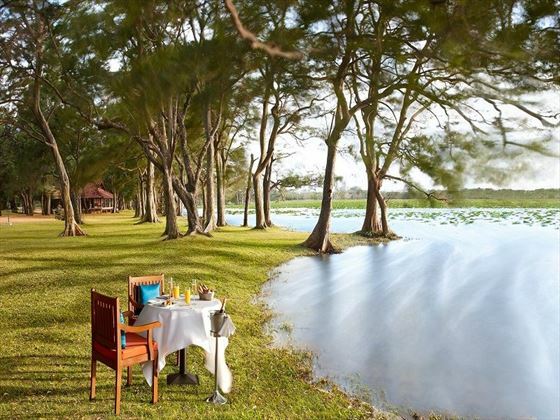 Relax on the rattan furniture and enjoy a light lunch, or head here for dinner and try one of the signature dishes – the pan-fried lake fish fillet with herb rice and local sour orange butter is a big hit. ALHENA”RESTAURANT – for all your entitled meals. 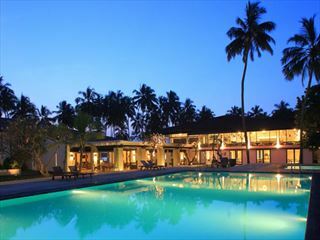 Please note that the AI package will include beverages such as Arrack, Local Beer by the glass, Rum, Gin, Vodka, Cocktails made out of local sprits, Soft drinks, Mineral water bottles and Fruit cordials. During meal times house wine will be served on request by the glass.